Daimler is cashing out its remaining 4 percent stake in Tesla Motors after being an investor for over five years, and it's done well, booking a $780 million windfall from the sale. Daimler originally purchased a 10 percent stake in Tesla back in 2009, later selling off 6 percent to an Abu Dhabi hedge fund that also had a stake in Daimler. "Our partnership with Tesla is very successful and will be continued," said Daimler CEO Dieter Zetsche in today's announcement. 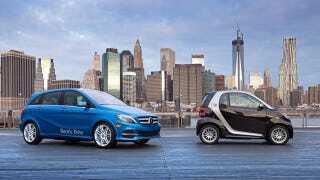 That partnership birthed the Smart ForTwo Electric Drive and B-Class EV, and Daimler will continue to purchase components from Tesla to build the B-Class, which is on sale in the states and set to launch in Europe before the end of the year. "We are extremely satisfied with the development of our investment in Tesla, but it is not necessary for our partnership and cooperation," said Bodo Uebber, Daimler financial board member. And walking away with $780 million ain't bad either.